Happy Kitchen Sink Monday! This week is Challenge Monday at Kitchen Sink Stamps. "Didn't your mom ever tell you NOT to run with scissors"? Well for this challenge I am saying it is okay!! Okay... maybe not to actually physically run with scissors, instead let's let our scissors do some running! This week's challenge is to have at least one cut image on your card...it does not have to be the focal point image, and you can cut one thing or many....that is up to you...but make sure and let your scissors do some running. Please remember all challenge entries must use Kitchen Sink Stamps, be sure you leave your link on the KSS Blog for your chance to win FREE Kitchen Sink Stamps. 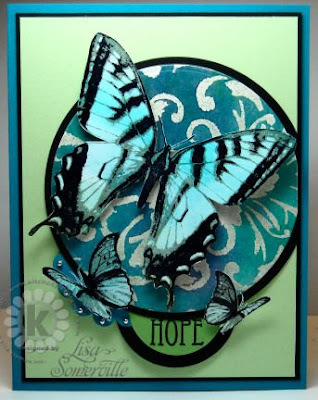 To create my card for this weeks challenge, I used the 3-Step Butterflies, omitting the stamping of Step 1. Instead I started with Step 2, stamping in Grey ink on a piece of leftover Spectrum Roll created with Caribbean Sea Ink. Step 3 is stamped in Black Archival, then clear embossed, so it was easier to cut out the Butterfly. I did the same steps with two smaller butterflies. The panel behind my Butterflies is created using the Batik Technique and the Kind Thoughts Flourish found in SU's Decor Elements Catalog (link on my sidebar). I didn't use colorwash sprays for my color, instead I misted the watercolor paper and smooshed my Caribbean Ink all over, then dried and continued on with the Batik Technique. The larger circles are cut with Nestabilities, I popped the butterflies up on dimensionals. I used my SAMJ to stamp HOPE from the Vintage Words plate. Oooh! What a beautiful creation with the butterflies! I love all the added dimension and details you created by embossing. Great take on the challenge! Such a fabulous layout to showcase your stunning butterflies!! Gorgeous embossing and breath-taking colors!! Wow, Lisa! This is stunning! Love the colors of your cut out butterflies, and that layout is fantastic! Gorgeous!! What an absolutely stunning card! I love everything about it! Thanks for sharing it. oh my gosh, those butterflies are GAW-JUS!!! I love the depth of color and how they're popped up! TFS! Thanks for sharing Lisa - love it! Wow Lisa, this is breathtaking! That butterfly looks just like the Blue Morpho butterflies at the Butterfly House! Stunning! Oh, if you butterfly needs a home I have room! ;D LOL! OMG Lisa!! This is absolutely gorgeous!! The cut out butterflies look so real and stunning!! Wowza!! This is beautiful, Lisa. I love the vibrant blue butterflies. Absolutely beautiful Lisa!!! I love every detail !! OMGosh, your butterflies are STUNNING! What beautiful color! Beautiful butterfly card! Love the colors and the layout is stunning!